Charity founder Brian Burnie arrives at John O’Groats! Above: Island Councillor for Wick and East Caithness, Willie MacKay with Brian Burnie. 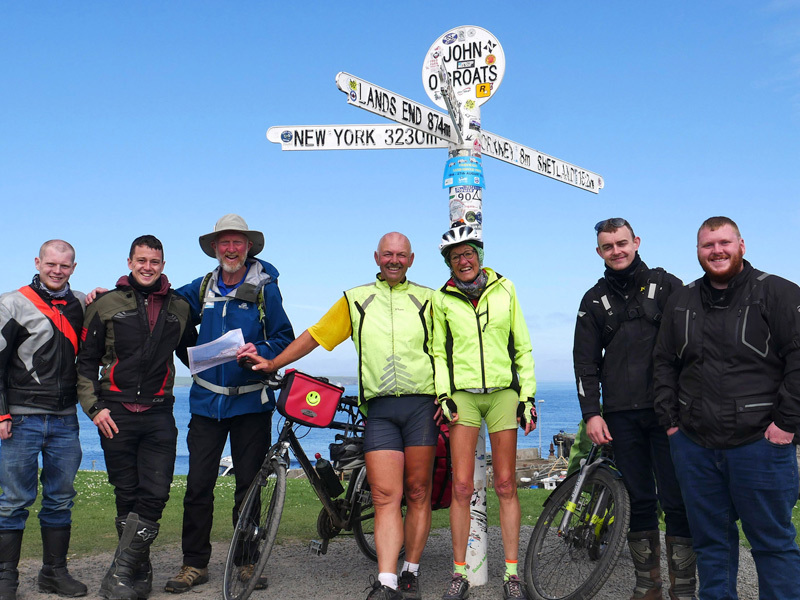 Huge ‘step’ forward for charity founder Brian Burnie as he arrives at John O’Groats. 808 miles walked along the coastal path taking Daft as a Brush Cancer Patient Care nationwide! D-Day 6th June 2018 Brian Burnie arrives at the iconic signpost at John O’Groats on his 7,000 mile walk around Great Britain and Ireland. 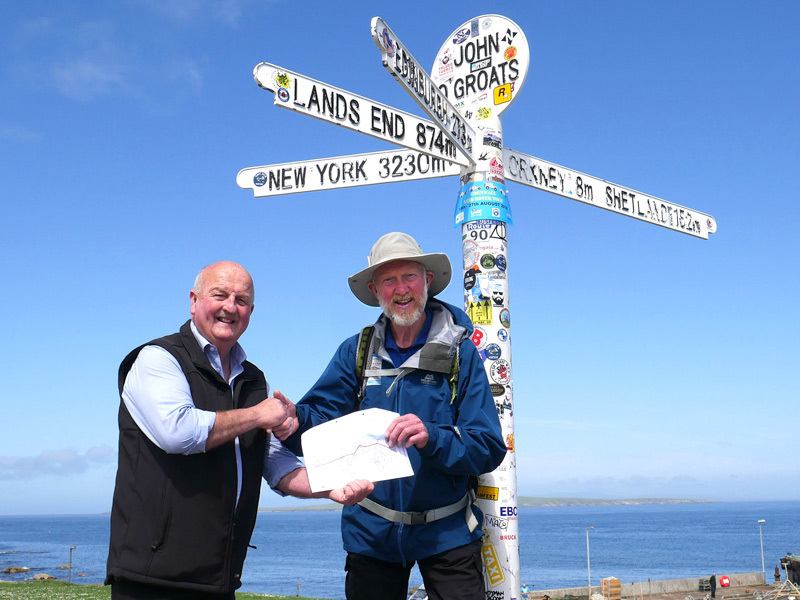 Brian, 74, couldn’t be happier; “Yes, it’s been very challenging, but walking into John O’Groats represents a great achievement. The first part of my journey is complete. I’ve met such fantastic people on the walk; everyone has offered support and encouragement it has been genuinely moving at times”. 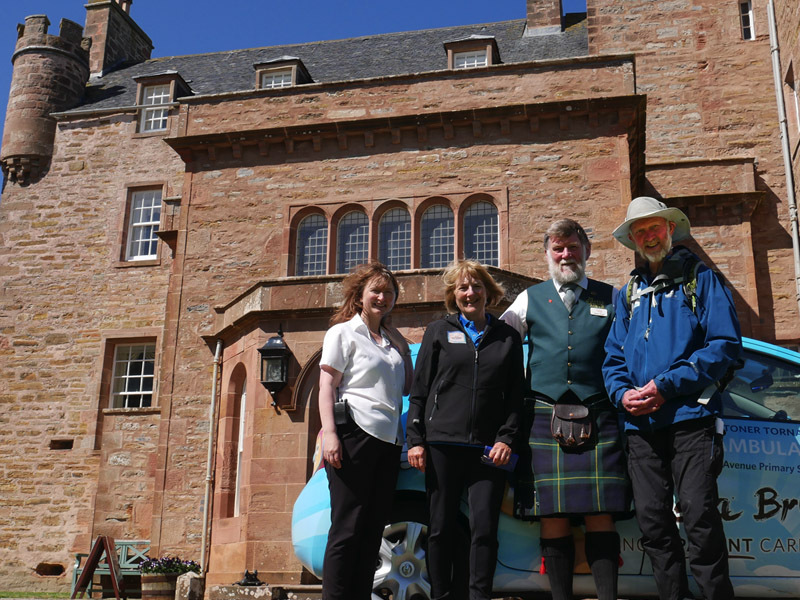 Brian was met by motorcyclists, walkers, cyclists and Island Councillor for Wick and East Caithness, Willie MacKay, “This is absolutely wonderful, what a great achievement for Brian, walking all the way from Newcastle. I think this is a great venture raising awareness for this wonderful charity. I do wish him all the best as he continues his coastal walk around the County of Caithness and his onward journey”. Brian’s walk continues to Thurso and on to Skye. His mission to create 1,000,000 cancer patient journeys all over Great Britain and Ireland is gaining momentum, one step at a time.